After last week’s introduction into the current state of the hotel market in and around Boston, MA I thought it would be a good idea to provide a couple of examples to further explain. To emphasize the volatility of hotel cash flow and the importance of specialized underwriting practices, the following charts summarize examples of hotel loans underwritten in 2000, just prior to the major hotel industry downturn that began in 2001 and compares the pre-recessionary and post-recessionary cash flow and debt service coverage. In this weeks example, a theoretical 175-room, full-service hotel located in the Boston/Cambridge market is assumed to exhibit the same averages for occupancy and average rate as the overall market during the period from 2000 to 2003. In 2000 the hotel performs at a 79 percent occupancy rate and a $200.00 average Daily Rate (ADR). 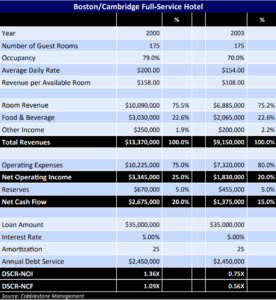 A theoretical income and expense statement of a hotel with these operating metrics is shown in the table to the right. Additional revenue assumptions include an F&B operation that generates revenue equal to 30 percent of room revenue and $250,000 in other revenue from miscellaneous sources. (DSCR) of 1.36X based on Net Operating Income (NOI) and a DSCR of 1.09X based on Net Cash Flow (NCF). Using the market performance metrics, in 2003, after the hotel experienced a 32 percent decline in revenue, Total Revenue is $9,151,000 with NOI of $1,830,000 and NCF of $1,370,000. The operating expenses of the hotel were adjusted to reflect the impact of lower occupancy on direct room related costs. Nevertheless, with high fixed costs, the overall savings in operating expenses were limited and the NOI margin was reduced to 20 percent. Because of these assumptions, DSCR levels are reduced to 0.75X and 0.56X based on NOI and NCF, respectively. This example is intended to show the dramatic change in DSCR after this major economic downturn. Worthy of note, based on these assumptions, the 2000 loan would need to be underwritten at $26.0 million (26 percent lower amount) with a NOI DSCR of 1.83X to achieve breakeven NOI DSCR in 2003. The 2000 loan would need to be underwritten at $19.5 million (44 percent lower) with a NOI DSCR of 2.44X to achieve breakeven NCF DSCR in 2003. If you have questions about this example or questions about anything in the hospitality lending area, we would like to help. Reach out to us at info@cobblestonerisk.com. Stay tuned for part three of the hospitality lending series next week for our second example of a limited service hotel in a suburban Boston market.